The international upswing in traditional realist painting — what's now being called "classical realism" — has a new face in Vermont: that of Emilie Lee. The 35-year-old returned home to Vermont last November after more than a decade of studying and making art, traveling, and rock climbing. When we met, Lee was visibly delighted to have reestablished herself in her native Green Mountain State, where she lives in Burlington's South End and works and teaches at the Brickwork Art Studios off Pine Street. The weekend of July 8 to 10, Lee will conduct a Farm to Canvas plein air landscape workshop in the New Haven farmhouse where she grew up. That house is now home to Golden Well Farm & Apiaries, owned by Ryan Miller and Nicole Burke. In addition to offering an Airbnb "farm stay" to students, Golden Well will provide homegrown lunches for Lee's class. Asked to name local contemporaries who work in traditional realism, Lee points to her Brickwork neighbor Monica Baumann, as well as to Vermont painters August Burns, Kate Gridley and Kalin Thomas. Generally speaking, traditional realism eschews the trends of contemporary art and follows the skill-based practices of 19th-century Western traditional painting. In 2008, at the behest of her Utah-based artist-mentor, Kamille Corry, Lee enrolled as a full-time student at New York's Grand Central Academy of Art, founded by prominent artist Jacob Collins. His atelier includes the Hudson River Fellowship, a program designed to address "the reawakening enthusiasm for classic American landscape painters, the vigorous scene of contemporary landscape painting and the urgent need for a renewed reverence for the land." That reverence is a driving force of Lee's work. She's currently finishing a series of landscapes made in conjunction with the American Prairie Reserve in Montana. Lee fashioned an independent artist residency to study and paint that wildlife habitat. She hopes the paintings — which she will debut this fall in New York — will contribute both financially and culturally to the APR in its mission to convert 3.5 million acres of plains land into the largest conservation area in the lower 48 states. 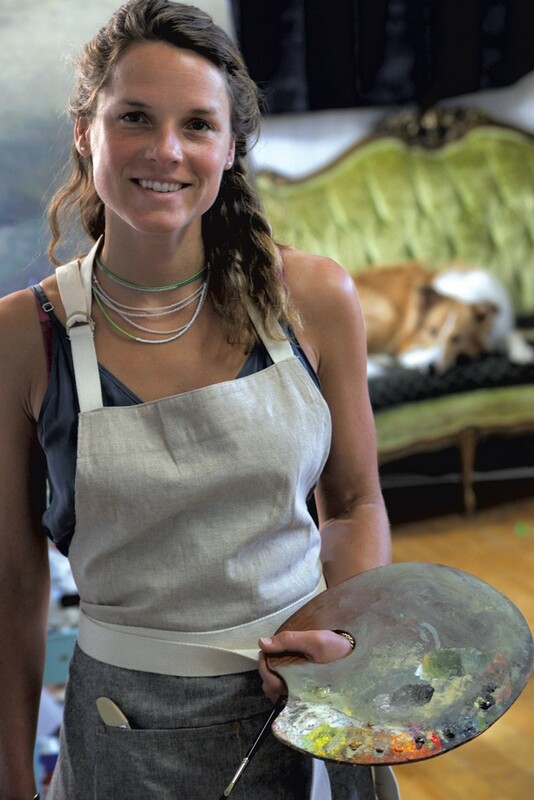 Seven Days sat down with Lee in her studio to discuss returning to Vermont and her part in the growing classical-realist movement. What brought you back home to Vermont? I needed more space, and I also realized that my work was increasingly taking me outside of New York to visit wilderness areas. I wanted to live in a place where I could have more access to nature and the lifestyle that I like — hiking and running and being outside. Can you talk about the evolution of your practice? I was raised by an artist, so I was always painting as a young child. I went to [Rhode Island School of Design] expecting to find the best in any kind of art education, but what I was really interested in was traditional realist painting. I wasn't able to find that at RISD. The painting department was very modern, and the illustration department was very commercial, so I had a frustrating experience there. After school, I took some time to pursue rock climbing. During that time I was doing some freelance illustration for magazines and companies in the outdoor industry. At a certain point I realized that I still wanted to pursue my interest in traditional painting, so I found a teacher [Corry] in Salt Lake City who had studied in Italy for 10 years. When I walked into her studio, it felt like I was going back in time to the 1800s. All her paintings and her drawings and her materials were all straight out of that time period. I studied with [Corry] for a year in Salt Lake City. She told me that if I really wanted to be competitive in this field, I had to move to New York City and study with Jacob Collins. She said, "Either go to New York or go to Florence." At the time, it was so hard to find traditional 19th-century academic art education. There were only about two places in the world offering it. Now there's a lot more, because that movement has spread, and that's what I'm teaching here in my studio. Why do you think there's renewed interest in traditional realist painting? I think the novelty of abstract painting has worn off a little bit. There's this expectation in the modern art world that you have to constantly be doing something completely new that's never been done before. Personally, I think that's kind of impossible. There are a lot of people who are drawn to traditional academic realism, but they've been afraid to express that. I know that I was ridiculed in college for being interested in it. I was told, "Why would you want to paint something that's already been done before?" — that I couldn't think for myself or wasn't being creative enough. [But] there's room for all types. I think the internet has really helped people find each other, honestly. There's a huge community on Facebook of people from all over the world who are interested in learning these techniques and now can access educational tools online and discover other artists and see their work. What drew you to this particular mode? This type of work is more about respecting nature as the artist. When I'm painting, I feel like I'm in meditation with my subject, and I'm trying to capture the magic of the moment with the light and the form. It's not like I'm trying to improve upon nature — I'm trying to respect exactly how nature made whatever it is I'm painting. I'm doing my best to honor it and present it in paint. There's also something really fun and satisfying about trying to get that illusion effect. I know that when I first started out studying, I just wanted to have a legitimate background in skill. I wanted to have a good foundation, and I felt like, if I had this kind of traditional training, I would be able to take that in any direction and do a better job with any type of artwork that I pursued. I was trying to make these paintings inspired by my experience as a rock climber; I was copying photographs that I took. I had a vision in my mind for this emotion that I wanted to express, but ... the paintings I was doing fell short of what I was attempting to express. That's what really led me to go seek out a teacher, because I realized I just didn't have the tools to bring my vision to life. That was the strongest indicator I had of the direction I wanted to go next. The original print version of this article was headlined "Getting Real"